Medical Emergency Preparation | A Savings WOW! When you go on a vacation, the last thing on your mind is probably thinking about what to pack in case you have a medical emergency happen to you or a fellow traveler. Unfortunately, this did happen to us recently during a trip to Orlando, FL. Through our journey, we’ve learned a few things and want to share with you some tips that may help you in case you ever find yourself in a situation like ours – on vacation, away from home, and having to deal with a medical emergency. 1. Make sure you pack your health insurance card(s) and prescription card(s). Our health insurance company issues a card for each family member. Honestly, I had thought about whether or not we needed to bring all six with us or just one to have JUST IN CASE. I’m really glad that this time, I decided to pack all of them. It definitely makes it a lot easier for you to give that information right away to the ambulance provider and hospital(s) so they can start processing the claims with your insurance company right away. When you are going through all of this, the last thing you want to have to remember is to go back and provide the insurance information afterwards so you are not stuck with the full bill. 2. Have a form of identification with you at all times. If you don’t have to show your ID at all during your vacation or don’t have to drive anywhere, it may seem like a hassle to carry around one extra thing while on vacation. However, in times of emergency, having the ID handy is very helpful. When Jim had his stroke and the ambulance came to pick him up, one of the things they asked for was his ID. If you are traveling with someone, make sure you know where their ID and insurance information is located and make sure to tell them where they can find your information. For example, in Jim’s case, he was not able to speak or write for a few days, so luckily I knew where he kept his ID and insurance information. 3. Tuck a list of your medications with the names, dosages, method, and frequency you take them, somewhere near your ID and insurance card. If you are able to, also include the contact information of your regular doctor(s). It will help emergency personnel to have that information when they are administering help to you. 4. Take extra money with you, whether it is cash or a credit card, and leave it just for emergencies. In our case, Jim’s medical emergency happened on the day before we were supposed to head back home. For many people, at the end of a vacation, you may be tapped out on your budget. We ended up having to stay an additional 2 1/2 weeks in Orlando. You want to make sure that you have enough money for meals, lodging, and possibly transportation to and from the hospital. While Jim was in the rehabilitation hospital, we met another person who was on vacation, fell, and broke her hip. There are many different things that can happen. We had also heard that having travel insurance (especially if you are from another country) can help with transportation costs to get you back home. This would be a good thing to discuss with a travel agent to see if it is worthwhile for your trip. 5. Create a list of important contacts with their names, phone numbers, and email addresses and include that with your information. Have close family members who you would want contacted in case of an emergency, neighbors who can check on your home for you, and on this list, be sure to include your employer’s information as well. Luckily, I had access to Jim’s cell phone, which had his manager’s phone number in it. I had called his work to let them know the situation and to let them know that he would not be at work the following week as was originally scheduled. Also, because Jim was not able to speak for a few days, I was able to make the arrangements with his work for the start of his FMLA and short-term disability. One thing I would suggest is granting your spouse or someone you trust well with the ability to speak to the insurance company, health benefits provider, work contacts, etc. Because of many privacy laws, some places will not share information with you or allow you to make decisions for your loved one without their consent. If your loved one provides it before anything like this happens, it makes it a smoother process. All it takes is a phone call or a written letter giving permission for information to be shared with that person. A great way to make sure that you have the information you need in case of a medical emergency is to have a spreadsheet or document with everything listed above in a cloud-based program, like Google docs, where you can share it with your fellow travelers and loved ones. It is very important to have a a hard copy also with your travel documents. 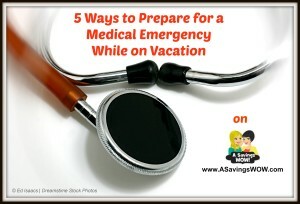 What other tips do you have to make sure that you are prepared in case of a medical emergency while you are on vacation? Please leave a comment below. This is filled with excellent advice. It’s terrible of me to admit, but I’ve literally never even considered this happening to us before now. I’ll have to make sure I throw a kit together before we go on vacations from now on. I’m sorry that this happened to you and thank you so much for the information. I can’t believe I haven’t thought of most of the tips here. Especially with how often our family travels. I have 72 hour emergency kits that just sit in out close “in case”. But what about all of the times we are gone from home during the year? I really need to sit down and get a few things together for vacations. Especially a list of contacts! Thanks for sharing and it was fun to visit your site for the first time! These are excellent tips. I am starting a job where I will be traveling solo and much of this wouldn’t have crossed my mind to travel with, now I will be better prepared. I think the best advice is to host the info in the cloud, so it’s easy to update and access. Might I suggest one more? Make sure your cell phone has “ICE” (In Case of Emergency)prior to the person’s first name in your contacts. This helps emergency personnel to know who to contact if you are in an accident alone and unable to communicate. Yikes! I hadn’t given much thought to those things, but I’m glad I found your post. We are planning a trip to Disney next year and my daughter is a type 2 diabetic and has autism. So, she has a long list of meds, and doctor info to take along! thanks for posting these tips. We will be going on a big trip soon and it is good to be informed. I just applied for our health insurance cards. Oh wow. First off, I hope Jim is doing better. How tragic to deal with an emergency during a vacation. This is a fantastic list and reminder to always be prepared when going out of town. You just never know what can happen, and when you are prepared, it can make things so much easier in these kinds of situations. I know in some phones you can designate certain contacts as IN CASE OF EMERGENCY. These days almost everyone has their cell phone on them, so keeping all this information on their cell phone would also be helpful. When my daughter Makayla was 3 months old she had her first cleft lip repair surgery. That is a whole story in itself. But a month after her surgery we went to visit family. Most of my family lives 3 hours away from me in the smallest of small towns. Makayla had been recovering well, and I wanted them to see her post surgery. The only real issue we were having with Makayla’s recovery was that her nasal passage ways were still pretty blocked. Mainly from the surgery, stitches and some light bleeding. It sounds much worse when you say it – but it’s just a part of the recovery process. But since Makayla was still so young, she breathed through her nose when she slept. I had come up with a million ways it seemed to try and keep her mouth open while she was sleeping. Because otherwise her air flow was very restricted. Our first night at my family’s house, Makayla had a really rough night. And in the morning when I woke up and looked over at her – she was blue! I mean really blue! I was screaming for my cousin to call 911!! I was holding Makayla and she was alert – but you could tell something wasn’t right. Thankfully her color was starting to come back and she was getting more oxygen because in this small town, you might actually keel over before an ambulance arrives. We waited 30 minutes!! Yes…I said 30 minutes! It was insane. Makayla spent 2 days in the hospital. And thankfully I had her insurance information and everything we needed. So I love your post because you just never know what is going to happen when you are away from home. It’s best to be as prepared as you can. Prepare for the unexpected – and hope the unexpected doesn’t happen in a tiny little town with 1 ambulance 😉 ay yi yi. I have learned first hand how important it is to be prepared! Two years ago my baby girl fell beside a pool and busted her chin open which resulted in needing stitches. A tip that saved us was calling the local walk-in-clinic, we knew that her chin did necessitate a trip to the ER and a bill three times as high as one needed. By calling the walk-in we were able to find a local doctor who took our insurance and saw cases like ours. That office was a God send. Instead of a sterile cold waiting room full of trauma we were treated like normal patients. It really helped calm my child down. I love the idea of travel insurance too if you are going to be gone for more than a few days and further than a few hours away from home. It’s always best to be safe rather than sorry later on. Great advice that many often don’t think about before traveling! This is a great list! Although not fun things to think about. I’m so sorry that this happened to you, and especially Jim! I do hope he is recovering ok. I lived in China for a year, and traveled around quite a bit, including Vietnam, and Thailand. I always had my passport on me, and had emergency evacuation insurance for the year as well. It was comforting to know that if I needed to be flown to a more modern hospital in a bigger city, for example, that could easily happen for me. Thanks for posting this list. I believe it will be very helpful for many! I have to admit that I don’t do any of these at all when traveling except for having our insurance cards because they stay in my wallet but after reading your tips and especially since we mostly travel with our kids I need to be better prepared for emergencies. Great tips here. Its great to always be prepared for an emergency. i will definitely keep these tips in mind for my next vacation. Wow. What an excellent list. I am surprised that you included #3…because I’ve never seen it included on such a list. Kudos to you for realizing how important that is. This is critical for everyone, including at least one (if not more) family members of an elderly or disabled family member. My grandmother had Alzheimer’s, and any time she would be taken to the hospital for anything, that’s one of the first (and most important) things they want/need to know…and you can’t just treat someone blindly, without knowing what medication they take. The same would apply for any individual who is unable to communicate, such as if they’re in an accident, or have a stroke, or a seizure, or are unconscious, etc. Knowing their list of medications can make a huge difference in their health care. The entire list, of course, is spot on. What some great ideas! I’ve never even thought about this when heading out for a vacation! Thank you so much for sharing! I’m bookmarking this to use for my next trip! Great tips! I definitely did not think of some of these and they will come in handy when we go on vacation in a few months! Thanks! Thank you for this list. I always carry my insurance card as well as my kids’ cards in my purse. I have to remember when I leave overnight without them to leave their cards with them… Just in case. WHat a great list and one to keep in preparation for our next vacation. Thanks for sharing such a complete list. I definitely follow tip 1, 2, and 4. However, I am fortunate enough that right now I don’t need to follow tip #3. I’ve always assumed that since I’d always have my phone with me, I won’t have to worry about #5. But then again, relying on my phone might not be such a good idea. Great tips! These are AWESOME tips! I specially need to work on carrying money with me. One of the things I do when we go on a trip is to pack a smal first aid case with the basics – peroxide, bandaids, ice pack, tylenol, etc. just in case. What great advice! I’m heading off to a mountain retreat this afternoon and I’m going to make sure that I have my cards, ID, and emergency contact list in order before I go! Great advice. How is your husband doing? I hope he recovered well. I have had this kind of issue on the brain because we are going away for 4 months–not a vacation, exactly, but a fun work trip–and I’m fretting about what the chances are of us not needing a doctor while we are gone. Praying we stay healthy, but I should research what there is around. We have two small children. Oh, wow! Sorry to hear that Jim became ill while vacationing. Hope he is feeling better. You have made some great points. Since we never know when something unexpected like this could happen, we must stay prepared. Believe it or not, this kind of thing really happens. It happened to us a few years back. The out of state hospital was great and thankfully it all worked out for us. Great tips for travel and safety. One thing I am not faithful about but would be a big help is a medication card! Thanks for reminding us of basics we should have with us. Great tips – I would have never thought of some of this stuff! I cross the border often for grocery/gas etc, and reading this made me realize that I need to check if my travel insurance is covering those day trips. This is an excellent list. It’s so important to be prepared for anything. I would add “bring a first aid kit” and “be aware of common dangers associated with your specific vacation.” We’ve been lucky so far to not have any emergencies during our vacations, but you never. When we travel I like to be as prepared as you are. I’ve even checked to see what hospital options we had where we were going to visit family out of the country. Traveling with a rambunctious boy makes an emergency room visit a possibility wherever we travel! Good Points. I pack by Murphy’s law. If I don’t pack it, I will need it. If I pack it, the odds are decreased that I will need it. Either way, I am prepared and it makes me sleep better. This was so informative and helpful.This has some really basic ideas that I know, I never thought about. Especially traveling with kids. Great tips. We will be taking a trip soon so they will come in handy. It’s always good to be hopeful for the best but prepared for the worst. These are really good and important tips. In fact, most of the tips are things you should always have on you. My hubby is a firefighter and these tips are important for home also. If you are on any special medications or have a disorder, it’s good for every medic to know in case of an accident. What a great list! Medical emergencies aren’t exactly on the top of my mind when I am preparing to travel, so this little reminder and list is a great resource. Thanks! This is an amazing post! I love to travel but a lot of this I would never have thought of. I always prided myself on being thorough. I travel less now, but also have many more reasons to pay attention to your ideas. This list will certainly come in handy on my next vacation. The funny thing is how we do not typically think of things like this. I have some basic things in my car for an emergency but I probably need to add some more. When I have kids then I am sure I will use this even more!